Global trade search tool needs YOUR help. 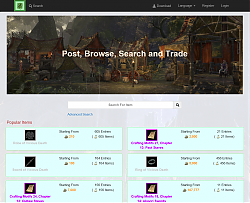 If you want to contribute more to the community or if you wish to help boosting up your guild's sale by uploading an entire guild's listings, you are more than welcome to do so! 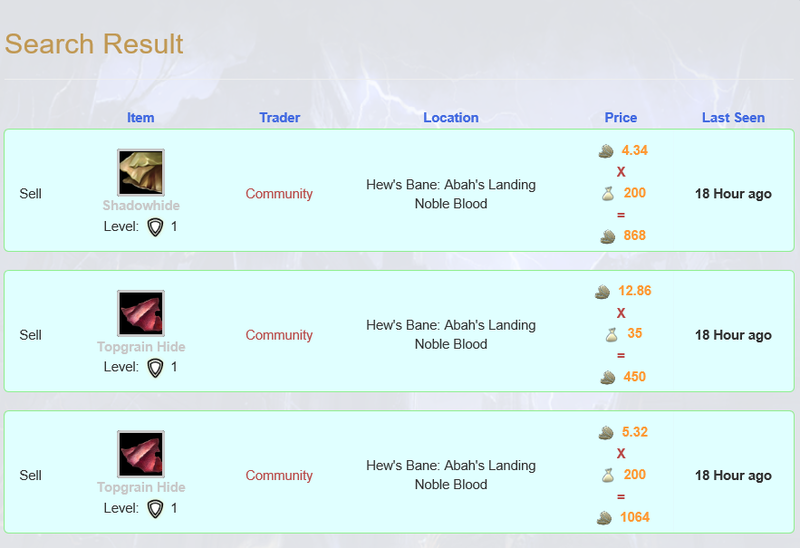 For the first time only, you need to go to bank NPC -> click on Guild Store. A dialog box should pop up asking you to wait while the addon scan existing guild listings. When finished, the "Auto scan completed" dialog will show up. Q:How does this addon work? 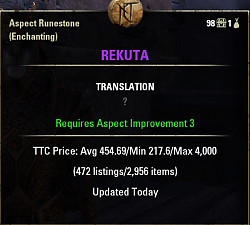 Q:How is the suggested price calculated? Q:Whats the difference between MM's price and TTC's price? Q: How fresh is the pricing data? It uses around 6mb of RAM for pricing info and around 20mb at most for entries you have seen. P.S. due to some backend structure change the saved settings will be reset. Your price data will stay safely since its downloaded from the server. 2. Store full scan code completely revamped. New scan logic will retry on failure (too many searches). In case of the game force close the store UI TTC will attempt to resume the scan the next time store is opened. 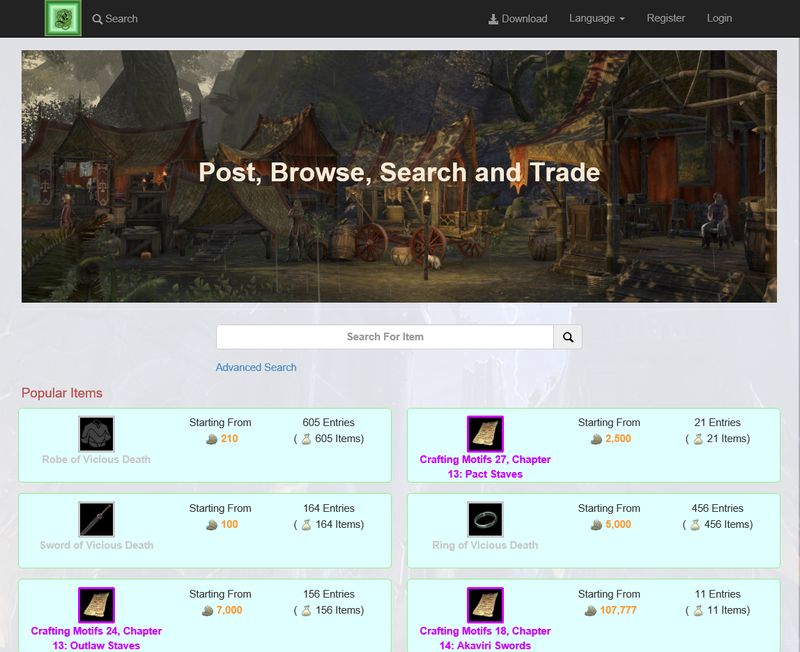 Known issue: The new ESO Guild Store UI has a bug which it will not update the UI listings when the search is initiated with API calls. Thus you are going to see the search result panel stay the same thru out the whole scan process. P.S. New items will be added in batch. Thanks for your patience. Known Issue: The client will remove manual created posts on the site. This will be fixed on the server side in the future. 1. Added multi account support. 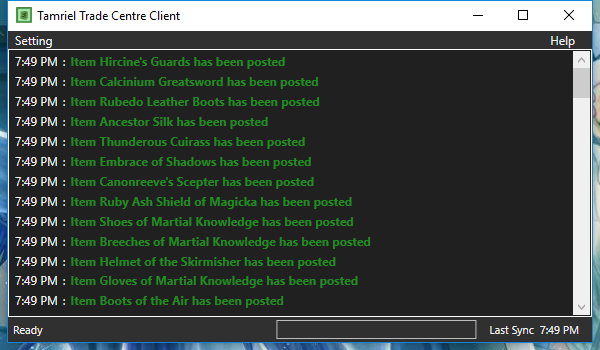 Players with multiple ESO account on the same machine will be able to use the client without issues now. 1. Completely separates the storage space for NA and EU server. This should prevent EU listings get posted to NA site or wise versa. 2. 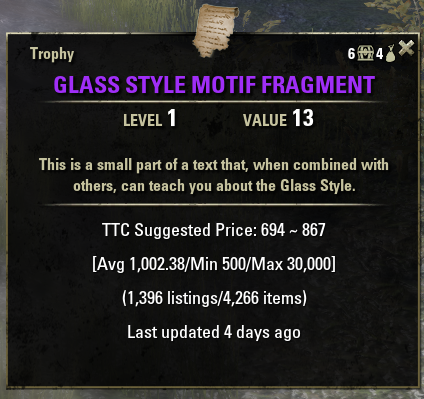 Fixed a bug causing alchemy writ's required potion attribute not showing up. 2. Small change to prepare for upcoming web client. 1. Store item will no longer get uploaded to the server if players attempts to buy it (even if player did not hit confirm on the prompt). This should further reduce the cases where the item is gone by the time one walks to the location. 2. New algorithm to determine trader location. 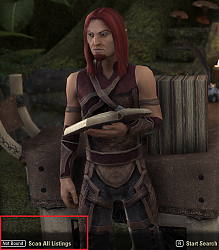 Should resolve all potential "this guild does not own a kiosk" errors caused by ZOS typo/inconsistent description. In the worse case scenario where the TTC is unable to detect the trader when player opened guild store interface from the bank NPC, the new algorithm will allow the player to scan by going to the actual trader NPC. 2. Fixed the issue causing launch ESO after client option not working with steam short cut. 2. 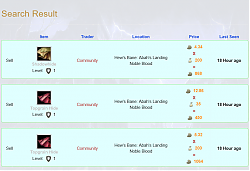 Fixed master writ's voucher reward amount calculation. Pricing for master writ might be unavailable for one day due to this change. 1. Fixed master writ's voucher reward amount calculation. Wrong amount should diminish overtime. 1. Fixes a problem where the client wont start and says it is not in the original location. The problem is due to client not being able to detect server region (NA/EU). Sorry, could not find anything related in TTC source code so far. Did you check the settingsmenu of AwesomeGuildStore and did you enable/disable the search boxes from AGS or standard ZOs boxes? Are they all GONE completely in the inventories? Or are they still visible but non-functional? I guess the author of TTC should know what he changed and where he did it, relating to search boxes. @cyxui Are you able to help here? Did you change anything on the search box at the trading house (inventory search box maybe, at the trading house "Post items" panel) or any other search box or function from the standard game? Or did you set any global variable from LibCommonInventory (libCIF) to disable search boxes? Nope. The only thing added is LibCustomMenu. Never touched any search box related parts. not sure if its related to the load order. TTC will load after AGS now, this might cause some other addon's load order to change if they flagged TTC as optional depends on. If LibCommonInventoryFilter is not fixing this (and it worked before, I'm sure) TTC might has altered the search box functions somehow without having noticed the library (it fixes search boxes in inventories and is used by AwesomeGuildStore and AdvancedFilters). I'll take a look at this later this week. Please use Votans Search box for now as workaround. Installing LibCommonInventoryFilters standalone does not fix it either. New TTC update works great in the context menus! Votan's Search Box addon adds the functionality back but that replaces the searchbox altogether. Why does TTC keep logging out even though you check the option to remain logged in? This isn't a weekly or monthly time out either. I just signed in yesterday or the day before and it made me do it again today even though I had the remain logged in option checked. I don't use IE at all so I don't ever clear any cookies in it. Also I am referring to the client.exe app, not the web based version. A new thing is happening now though. Now it won't log in at all. Click to log in and TTC crashes every single time but it will update the price table just fine. Uninstalled and reinstalled...same thing. Uninstalled with variables deleted as well, reinstalled...same thing still. Nothing on my pc changed. Not sure why this suddenly changed as the only thing that has been updated are the addons through minion. Found the solution to the log in problem.......I had to go in and set it to run as admin for the exe file. Saving the log in issue still exists though. TTC uses IE as embedded browser (since this is the only browser that I can safely assume everyone has). I don't think you can remove IE from your system. But if you disable it the login feature might not work as expected. Re: ETA for New Style Pages being listed? I was wondering when the new (outfit) style pages will begin to show in TTC? I notice the Lyris Titanborn set doesn't seem to be there yet; and tomorrow we get the Abnar Tharn style pages to be followed by the wossisname (Sai Sahan ) style pages. Cheers and as always thanks for a great addon. Last edited by jeradl : 04/18/19 at 08:52 PM. ETA for New Style Pages being listed? Last edited by Shadowshire : 04/15/19 at 09:46 PM. Can everyone who has issue with AGS tooltip try this and let me know if it fixes the problem? Be sure to write AwesomeGuildStore as a continuous string without any blank spaces between the words. Last edited by Shadowshire : 04/13/19 at 10:18 PM.